The following comments apply to the pre-release digital screener of Both Sides Now: Joni Mitchell Live at the Isle of Wight Festival 1970 provided by Eagle Vision and one that did not contain the bonus material. By way of full disclosure, I have had “a thing” for Canadian singer Joni Mitchell for half a century. Her confessional album Blue (as many early ones certainly were) was the last record I bought before reporting for active duty in the U.S. Army in 1971. I have also had the pleasure of reviewing one of her previous Blu-ray transferred performance videos, Joni Mitchell: A Life Story: Woman of Heart & Mind/Painting with Words and Music. This video is a snapshot in time of the 1970 Isle of Wight Festival with attendance estimated between 600,000 and 700,00, dwarfing the Woodstock festival held a year earlier in New York. This massive rock concert was soon steeped in controversy as promoters Ron and Ray Foulk realized that their ticket prices were too low to make the event profitable. Further discontent was sowed by the thousands of disgruntled fans not holding festival tickets who were blocked out by a hastily constructed corrugated metal wall. There are also frequent obscenity-riddled demonstrations about the commercialism that has “taken over” popular music. Such concerns aside, it seemed when Joni first took the stage all would be well, but not so fast. A clearly disturbed fan gets onto the back of the stage and has to be forcibly taken away. 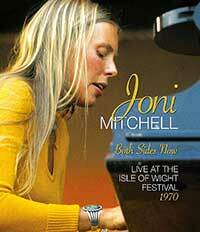 Mitchell returns to the piano only to be greeted by shouts and whistles from an unruly audience.In Joni’s own words “they fed me to the beast.” She quiets the hecklers with a brief anecdote about attending a recent Hopi snake festival and finally gets the attention and respect that she deserves. The format of the remainder of Both Sides Now: Joni Mitchell Live at the Isle of Wight Festival 1970 alternates Joni’s live performances with excerpts from a 2003 interview that recalled the events of that now legendary music festival. There are occasional cut-aways to the crowd that convey the shifting moods of true music fans, potheads, acid-droppers, and protestors. The only bonus material included on the disc is the uninterrupted playlist as noted below that will allow viewers to get the songs without the distractions of a boorish audience. The video is pretty much what you might expect from an in-the-field film that varies widely in color palette and detail but, for the most part, is quite decent for a documentary effort of its era. The late Murray Lerner, whose documentary film of the Newport Folk Festival received a 1967 Oscar nomination, knows his way around music festivals and that experience really shows in this release, shot just three years later. The audio is unvarnished but serviceable LPCM 1.0 that provides a nice account of the Mitchell soprano with its agile vocalisms and unmistakable timbre. It also perfectly suits her unusual guitar tunings and suspension or “sus” piano chords. Fans of this legendary artist like myself will get to take a nostalgic trip down memory lane with Both Sides Now: Joni Mitchell Live at the Isle of Wight Festival 1970 and see a truly unique talent delivering peak performances that typified her “folkie” period. Some foul language and wretched behavior from the huge crowd aside, this is a treasurable release that I will certainly want to watch again and again. Highly recommended. A "you are there" view of Canadian folkie Joni Mitchell's concert performance at the massive 1970 Isle of Wight music festival that pulls no punches when it comes to the unruly and occasionally disruptive crowd in attendance. Viewers wishing to avoid fans behaving badly can go directly to the playlist and skip the rest.